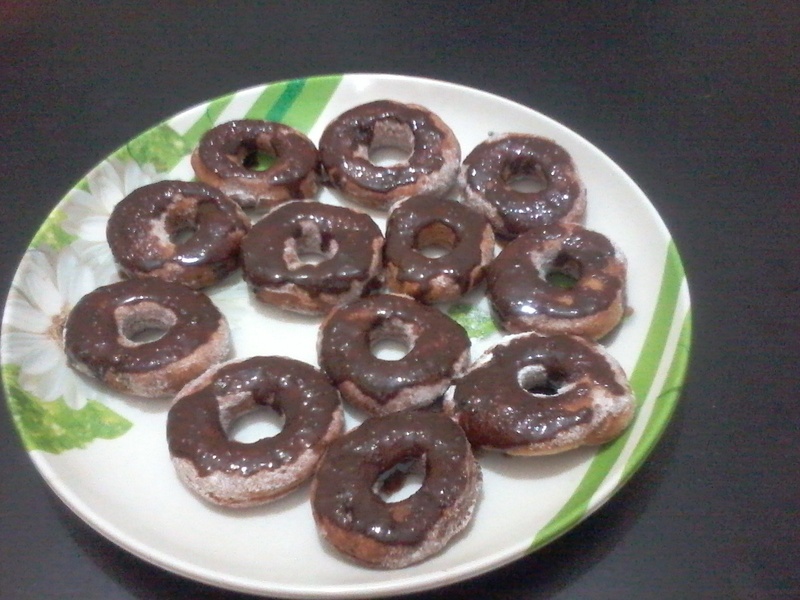 Today I going to share recipe of Home made Doughnuts which I had tried few times and it turned out well. 1.Boil the milk till lukewarm . 2.Add sugar , salt , dry active yeast to white flour. 3.Bring butter to normal temperature and add to flour . 4.Add luke warm milk to this mixture and make a soft dough. 5.Knead for 5 minutes till the dough is soft. 6.Roll it using rolling pin of 1/2 inch thickness. 7.Using a cutter or steel glass cut the doughnuts in form of circles , again cut using a smaller cutter to get that ring shape. 8.Heat oil in a pan or kadahi . 9.Fry the doughnuts turning both sides till crispy brown. 10.Take out and keep it on a tissue paper which would absorb excess oil. 11Melt the dark chocolate in a microwave or double boiler . This is quite easy to prepare and is liked by people of all age group specially small kids .